Dursley is a village in Gloucestershire, under the North East flank of Stinchcombe Hill, part of the Cotswold Edge, and about 4 miles from the River Severn. The town is adjacent to the largher village of Cam which, though a village, is a community of double the size. The two communities (combined population about 12,000) share many facilities. Dursley gained borough status in 1471, which lasted until 1886. The Parish Church of St. James the Great dates from the 13th century, but the modern building is largely of 14th and 15th century construction. The original church spire collapsed in January 1699 during a bell-ringing session, causing casualties. The current bell tower, in an imposing 'Gothic Survival' style was built by Thomas Sumsion of Colerne in the years 1708-09. 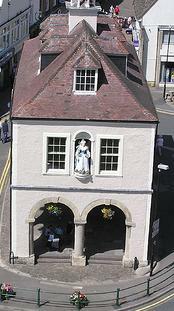 The pillared market house, complete with statue of Queen Anne and bell turret, dates from 1738, when Dursley's markets attracted farmers and traders from miles around. In 1856 a short branch line railway, the Dursley and Midland Junction Railway, opened linking Dursley and Cam to the Bristol - Gloucester main line at Coaley Junction. The branch line was closed in 1968. Coaley Junction station was also closed at about this time. However, in 1994 a new railway station called Cam and Dursley was opened on the main line near the site of Coaley Junction. In the 19th and 20th centuries Dursley was a large-scale manufacturing town, and the engines built here by Lister stationary engine company were seen around the world. That company's successor, Lister-Petter, is still based in the town, though much of the original 92-acre factory site was acquired in 2000 by the South West Regional Development Agency and is now part of a large housing development. The Towers, a large gothic-style house, formerly part of the Lister Petter estate, still overlooks the town and the site has been converted into flats and a residential care home. Historically, other large factories based in the town included Mawdsleys, an electrical equipment manufacturer, Bymacks an upholsterers and the Bailey Newspaper Group, a newspaper printer, all of which have reduced or closed operations in recent years. Dursley sits on the edge of the Cotswold escarpment where it drops off towards the Severn Vale and the River Severn. Dursley's main watercourse is the River Cam, and the town is surrounded by beautiful woodland and countryside. The Cotswold Way long distance trail passes through Dursley. Stinchcombe Hill provides a scenic backdrop to much of the town. It has an 18 hole golf course. The Hill has had a great deal of work carried out by volunteers since 1992, in an attempt to restore the open views over the Severn Vale. The cleared areas can be seen from the M5 motorway. The Cotswold Way has now been re-routed around the Hill to take advantage of this work. Markets are held at the Market Place in the centre of the town, and a Farmers Market is held there on the second Saturday of every month. Continuing urban sprawl now joins Dursley and the nearby village of Cam. Dursley has a number of licensed premises and the Old Spot pub is regularly voted Gloucestershire Pub of the Year. The pub was also named as 2007 CAMRA National Pub of the year. Around 1496, the famous Christian translator and martyr, William Tyndale was born here. Mikael Pedersen invented the Pedersen bicycle in Dursley in the 19th Century. Dursley once had a castle, built by Roger de Berkeley in 1153. Harry Potter author JK Rowling, born in nearby Yate, named the Dursley family in the Potter books after the town. It has been claimed that William Shakespeare may have spent part or all of the eight years between 1582 and 1590, a period of his life of which little is known, in Dursley, possibly working as a school teacher. The writer Evelyn Waugh lived in nearby Stinchcombe between 1937 and 1956. This page was last modified on 27 January 2016, at 17:20.